It is mid-July and depending on where you live it is either the peak of summer heat or you are just entering the hottest part of the summer. Either way, we all need to be drinking lots of water! As I mentioned in my last post about Infused Water I always struggle to get enough water throughout the day. Infusing my water is a great way to keep me motivated to drink more! It tastes good, it looks amazing, and it is basically your own homemade vitamin water! So good for you! 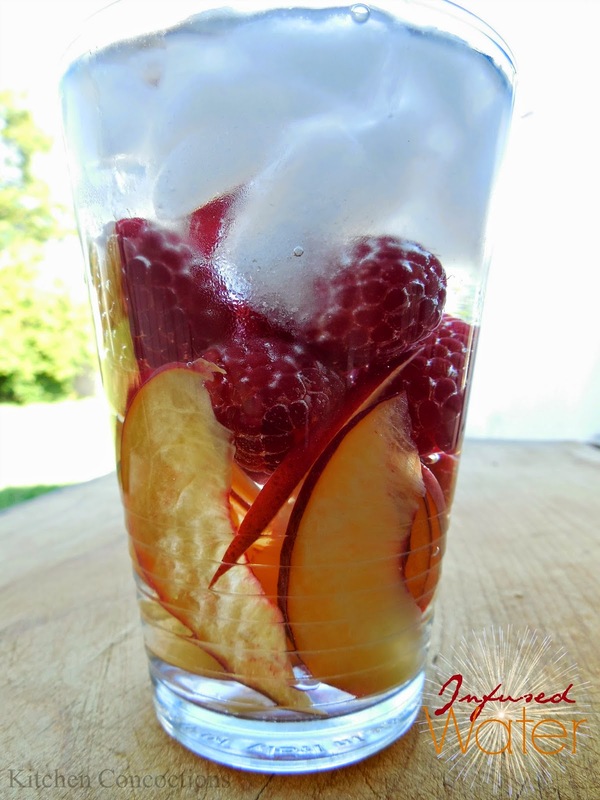 I seriously loved sipping on this infused water all day! When I finished the water that was in my water bottle I just filled it up again, shook it up to get a little more juice out of the fruit and just kept sipping. My suggestion: Serve infused water, rather than soda, at any part you are throwing! Your guests will be impressed and everyone will benefit from the water and vitamins. Another thing I have found that helps me drink more water is keeping a water bottle near by and having another one in the fridge cooling off, so it is ready to go when I need it. I love really cold water. :) I probably drink twice as much water if it is really cold. Ice cubes are fantastic! Use an app to help you remember (or keep track of how much you have had that day), or set an alarm. This is especially helpful if you are the type of person that just forgets to drink water. Wash the raspberries and nectarines. Thinly slice the nectarines and then put both the nectarines and the raspberries in a pitcher. Lightly bruise the fruits with a wooden spoon. Pour the water into the pitcher and put it in the fridge for about 10-15 minutes to let the fruit juices infuse the water. Add ice just before serving.